Tim, Summer and Jeffrey chat with David J. Eagle, director of 13 episodes from Seasons 2-5, including the Hugo Award winning “Severed Dreams”. 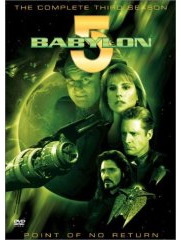 David talks about how he came to Babylon 5, the tendency of his episodes to be the high-impact ones, the joy of getting a complete script to work with from JMS weeks before shooting started, a little bit about his friendship with Isaac Asimov, and touches on some of his current projects. Next, Tim and Summer discuss “Survivors”, one of the first set-up episodes that has major repercussions throughout the rest of the series. We have varying opinions on the strengths and weaknesses of the episode. Listener Feedback: Tim, Summer and Jeffrey dive into emails from Brian asking whether B5 will show up on TV again; Michael corrects himself on talking about longer “trailers” instead of the “gag reels”; Jason Rennie of The SciPhi Show on alternate audio tracks in files available for download; and David comments on the realism of the Ranger’s pike. Your feedback does matter, and is welcome! You can call, or email us and tell us what you think… and likely hear it played or read on the show. I apologize for this show going out a little later than usual. Chalk the delay up to FarPoint Media growing pains, which are actually a very good thing. One thing I think this episode sets up for later is a pattern of erratic behavior (alcohol based or otherwise) for Garibaldi. You want to completely trust him but you never 100% without-a-doubt can predict what he will do and how he will react to something. As he demonstrates more than once in the coming seasons. But this is something I wouldn’t have picked up on when I watched it for the first time.